Who is Your Favorite LGBT Character in Scifi? Who is your favorite LGBT Character in Scifi and why are they so? 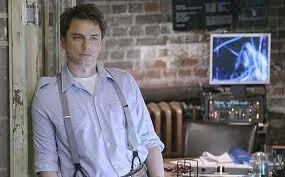 My favorite LGBT character is Captain Jack Harkness though you probably already guessed so. Being yummy helps but it is not the only reason why. It is also because I identify with him, his strength, and his nobility of spirit. Captian Jack is Bi sexual. This is a harder place to be in then most would think because being on the fence between two cultures tends to leave one alien to both. This is shown more through Jack and his relationships to those around him. He is there throughout a lot of England’s history even participating in events yet never really a part of it. Some think Being Bi is easy since one could hide amongst the mundanes. This is far from the truth. One can hide amongst the mundanes participating in all of their acts but never really be part of them, denying 1/2 of who they are. Only true acceptance of one’s unique diversity can it set you free. It takes so much energy to be someone else, to keep up a mask of who one should be. Imagine how much more energy a person would have if they didn’t have to spend it on keeping up the facade. He draws that strength from knowing who and what he is and being himself. He understands that life is shades of gray rather black and white. Shades of queer rather then straight or gay. It is through this understanding that he draws his confidence and swagger. Jack knows who he is, what he likes and what he wants this gives him the strength of decisiveness. It is for these strength that I love and am inspired by Captain Jack.